These footsteps were causing the stress to pile up inside me. The next day I went to another resident of the 4th floor and asked him about the footsteps. He looked like a salaryman. When I asked him about the question, he flatly refused about hearing any footsteps. Clearly, he didn't want to be bothered by me. I ascended the stairs and arrived on the 5th floor, but found that the room was emtpy. I didn't think that the footsteps were caused by ghost or anything like that. To me, it looked more like a prank. I went back to my room thinking how that salaryman looked suspicious. That night too the footsteps appeared as expected. And so, the stress that was piling up inside me for 3 days exploded, and I shouted at that person: "SHUT THE HELL UP!" As usual, the footsteps stopped after reaching my floor. I took a peek outside using the peep hole on the main door, but there was nobody. At the very moment, my whole body felt a cold chill and started shivering. I still remember it clearly. I quickly switched on the lights and then the TV. That night I couldn't sleep. The next morning I had work, so I got out of my room and descended the stairs. I met this old woman who lived on 2nd floor. I wanted to tell someone what I experienced last night, so I told her everything. And then, the woman told me something that left me speechless. Around 20 years ago, a family of 4 lived on the 5th floor: the husband, wife and their two children. One day, the husband forced the family for a double suicide. 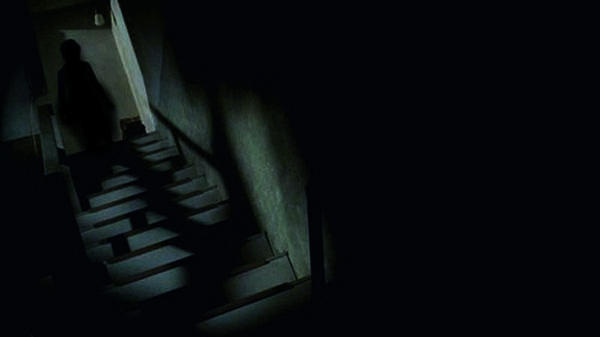 The brother saw his sister getting murdered by the mother, so he escaped from the room and ran down the stairs. But while doing so, he tripped and fell down the stairs, his head hit hard on the 4th floor, killing him instantaneously. From that time, his footsteps could be heard at 3 A.M. in the night. Right after I gained consciousness, I fled from the apartment and stayed at my coworker's house. After a few days, I moved out of the apartment permanently.